Floor drains inside buildings can be used in floors that only handle water. A sewer box or catch basin must be used where process waste spillage can occur inside a building. back up through the floor drains causing explosions and flash fires. A water source for the seals in running traps, normally provided in sewer branches running from buildings, is not available because little, if any, water is available from washing floors or any other source. Because the floors usually receive only an occasional mopping, the sewer line and trap seal can dry up allowing sewer gases to enter the buildings. Sewer branch mains from a pump house, compressor house, or any enclosed building should have connections to sewer systems at manholes or catch basins with an inlet provided with a seal. 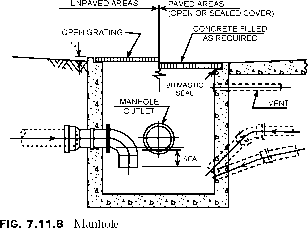 Where these connections are not feasible, building drains and separately defined areas should have running clean-out traps (P trap) located outside building walls with accessible clean-out plugs to avoid disturbing the paving. Running a sewer branch or subbranch in one plane from a drain hub to a catch basin and from a catch basin to a manhole, prevents the sewer line from clogging and facilitates rodding and cleaning. Whenever possible, all sewer system branch connections should be at a catch basin or manhole. wall to the nearest manhole. 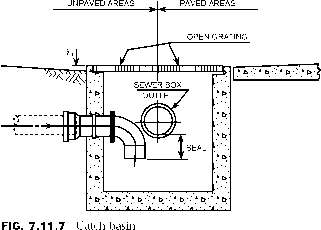 The sewer outlet connection inside the catch basin should use a flap valve (see Figure 7.11.9). 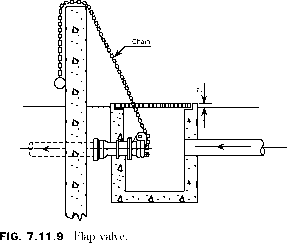 A flap valve operates, by chain, at the curb or dike wall. It should be closed at all times except to drain surface water from the enclosure. A gate valve should be installed in the sewer line outside the enclosure and have an extension stem for operation at grade level. When a leak or break occurs in the storage tank or piping, the flap valve prevents loss of tank contents and allows for the recovery of tank contents retained within the diked area. It also prevents large amounts of hazardous and flammable liquids from entering the sewer system, which can create a hazardous fire condition if tank contents are volatile. Drain lines that collect hot, noncorrosive waste drainage above 210°F, such as boiler blow-off, steam trap discharges, and hot waste drainage, without receiving cooling quench from other streams should be constructed of steel pipe and fittings. The steel sewer pipe should be run to the nearest catch basin or manhole. Hot acid waste drainage should be run in acid-resistant, alloy material sewer pipe and fittings. A valve box for underground pipelines should have side walls with drainage only through a gravel bed at the open bottom of the valve box. Sewer pipes running under roadways and trucking areas must be protected from damage by heavy concrete slabs or protective pipe sleeves. Sewer pipes embedded in concrete foundations should be constructed of steel pipe and fittings.